Only 5 days ago the brilliant team behind the android-wifi-tether project, which provides free WiFi hotspot capabilities to rooted phones, added support for EVO 4G. This meant users of this recently released beast could now turn their phones into WiFi routers, broadcasting WiFi signal to devices nearby, thus removing the need for a similar application Sprint charges $30/month for. The android-wifi-tether hotspot ran in ad-hoc mode, which meant devices that didn't support ad-hoc mode couldn't use or even see it. This included other Android phones, some game consoles (like the Wii), and other devices. Another limitation was lack of support for WPA/WPA2, which offer a much stronger security than WEP. WEP is weak and easily breakable; though combined with whitelist support, it was still relatively secure. 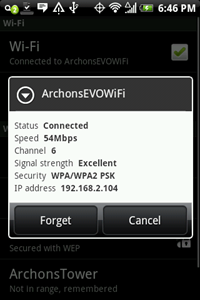 Following the discovery of a secondary firmware file within the EVO's directory structure and undocumented driver calls in the source, the team working on the android-wifi-tether project have fully implemented infrastructure mode on the Sprint EVO 4G, allowing users the same experience as if they were using the bundled Sprint Hotspot application, but without the $30 monthly fee. 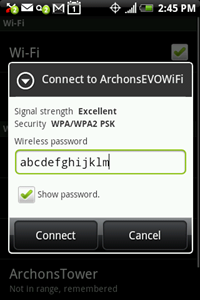 By fully supporting infrastructure mode vs the previous ad-hoc only mode, you will now be able to enjoy the full wireless hotspot experience, including support for WPA2 encryption, compatibility with a larger set of devices, and easier configuration on the client device. This application adds yet another bullet point to the long list of reasons to root your Android device. In combination with the unrEVOked one-click root you can go from a phone fresh out of the box to free, feature-full wireless hotspot capability in under 5 minutes. For now, only the EVO 4G supports the newly added WPA2 and infrastructure mode, while the rest of the Android phone lineup will default to the previous ad-hoc+WEP mode. Next on the feature list will be full support for the newly rooted HTC Incredible, and possibly other phones. Now that WPA2 and infrastructure mode have been added, the $30/month Sprint WiFi Hotspot application offers almost no benefits. The only feature still not present in the Android WiFi Tether app for root users is automatic hotspot shutdown after a period of inactivity, which could provide considerable battery savings for the forgetful ones. There is already a ticket to add this support, so hopefully it will get implemented one day. Also untested are both apps' effects on battery life, but because they use the same firmware, I am thinking they should be quite comparable (I would definitely have a charger ready in either case). Download Android WiFi Tether version 2.0.5-pre1 or above from the download page in order to get the functionality described above and report back with your success story.